We have been manufacturing customized and personalized containers since 1975. Over the years, our ISO container range has been considerably enhanced to include all steel types, while, at the same time, commercial efforts have allowed to widen our client base which includes major worldwide Shipping Lines and Containers Lessors, Intermodal Operators and Forwarding Companies. 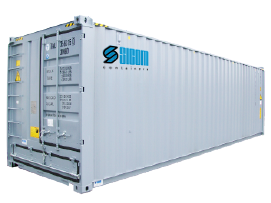 Sicom SpA is the European leader in the manufacturing of containers in terms of production capacity and range of products, being able to supply all possible units for the transport of dry goods. The know-how acquired during 40 years of activity enables us to provide customized, on-demand solutions, also according to the specific needs of the customer. All units are manufactured in Italy in order to ensure reduced times of preparation and high standards of quality. The catalogue includes the best-known types of intermodal units designed for road, rail and sea transport, with both ISO standard dimensions and customized dimensions. 7,45 – 7,82 m ISOTHERMAL VAN SWAP BODY – NEW! Sicom SpA promotes intermodal transport as it represents the future of goods mobility and of environmental protection, allowing the reduction of CO2 emissions through a significant reduction in road haulage. The plant is provided with its own feeder line and rail terminal for the shipping of units to the major destinations in Italy and Europe by block train. Its geographical position is extremely favourable as it is situated on the major East/West and North/South traffic routes. The ports of Savona and Genoa are respectively 80 and 130 km away. The terminal is equipped with reach stackers for the handling of empty/laden units and large yards with covered areas for the possible storage of materials. We have availability in stock for 40ft ISO Open Top containers, blue color, blue tarpaulin. Contact us for any additional information.